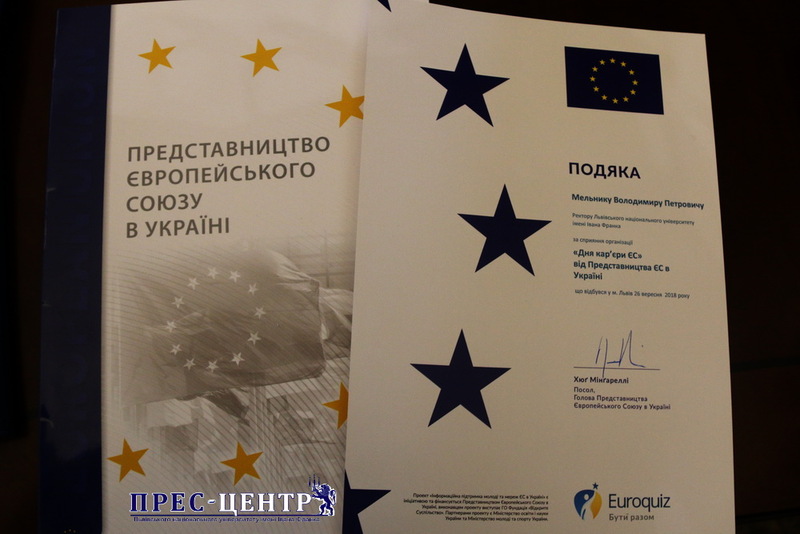 The EU Career Day, which took place on September 26, 2018, at the Ivan Franko National University of Lviv, was highly appreciated by the Delegation of the European Union to Ukraine. In particular, the Head of the EU Delegation to Ukraine Ambassador Hug Mingarelli thanked the Rector of Lviv University Volodymyr Melnyk for the support and help in organizing and holding this large-scale event. The Co-organizers of the EU Career Day in Lviv University were the Information Center of the European Union at the Ivan Franko National University and the Student and Graduate Employment Promotion Department. It is pleasant that the format of the event, ideas, and creativity shown by the University representatives were highly appreciated by the EU Delegation and from now on they are included in the list of basic requirements for the following events. The organizers have already applied to host the next EU Career Day in April 2019.